After two poor starts for short-season Bend, Dan Henrikson came out in this July 1990 game and threw a gem, according to The Bend Bulletin. Henrickson went eight innings, struck out 12 and gave up a single run, The Bulletin wrote. "Dan was in command, that was my biggest thing," Bend manager Mike Bubalo told The Bulletin afterward. Henrickson found that command in his second season as a pro. He went on to see seven seasons. He never made AA. Henrickson's career began in 1989, taken by the Giants in the 41st round of the draft out of Eastern Illinois University. 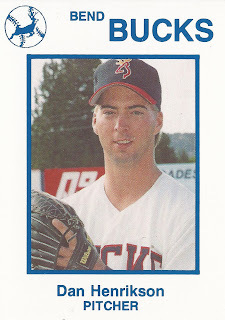 Henrickson started with the Giants at short-season Everett. He posted a 4.13 ERA over 24 relief outings. He moved to Bend and returned to Everett for 1990. He went 10-3 overall, with a 3.08 ERA. He played 1991 at single-A Clinton. He played briefly in 1992 and 1993 between Clinton and high-A San Jose. He got into 10 games in 1992 and 12 in 1993. He returned to Clinton and San Jose for a full 1994. In 47 mostly relief outings, he went 4-5, with a 4.23 mark. He played just seven games at San Jose in 1995, then finished out the season and his career at independent Salinas.